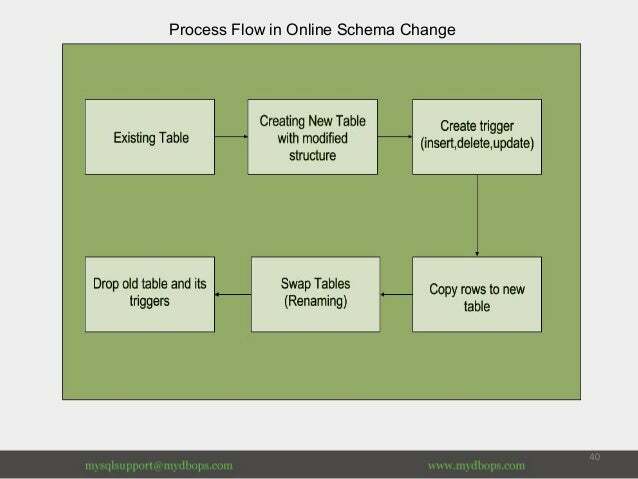 In this post, We will learn how to handle online schema change if the table has triggers. In PXC, an alter can be made directly ( TOI ) on tables with less than a 1G ( by default) , but on a 20GB or 200GB table we need some downtime to do ( RSU ). Pt-osc is a good choice for Percona Cluster/Galera. By default percona toolkit’s pt-online-schema-change will create After “insert / update / delete” triggers for maintaining the sync between the shadow and the original table. If the tables has triggers already then pt-osc wont work well in those cases. It was an limitation with online schema changes. Still MySQL 5.6, We cannot create multiple triggers for the same event and type. On this case, We will have to drop the triggers before starting online schema change. And re-create the triggers after completion of online schema change. In a production environment it’s a complex operation to perform and requires a downtime. The table `mydbops`.`employees` has triggers. This tool needs to create its own triggers, so the table cannot already have triggers. From MySQL 5.7.2, A table can hold multiple triggers. It is possible to define multiple triggers for a given table that have the same trigger event and action time. For example, you can have two BEFORE UPDATE triggers for a table. Complete list of new features of MySQL 5.7 here. This relaxed the complexity of implementation of pt-osc support for tables with triggers. pt-online-schema-change – v3.0.4, released on 2017-08-02 came with an option –preserve-triggers. Which added a 5.7 only feature, To allow pt-osc to handle OSC operation even the table has triggers. Created new table mydbops._employees_new OK.
2018-03-02T07:27:35 Adding original triggers to new table. 2018-03-02T07:27:36 Swapped original and new tables OK.
2018-03-02T07:27:36 Dropped old table `mydbops`.`_employees_old` OK.
–preserve-triggers If this option is enabled, pt-online-schema-change will create all the existing triggers to the new table (mydbops._employees_new) after copying rows from the original table (mydbops.employees). Explained the output with PTDEBUG=1 enabled for better understanding. 1. pt-osc created similar table and applied modifications on it. 2. pt-osc created After [insert / update / delete] triggers to sync the upcoming data between the source table and new table. 3. pt-osc copied the existing records. 4. After existing row copied, pt-osc created the trigger present on the source table to the newly created table (mydbops._employees_new). 5. Swapping the table and dropping the triggers. 2018-03-02T05:56:47 Swapped original and new tables OK.
2018-03-02T05:56:47 Dropped old table `mydbops`.`_employees_old` OK. I hope this gives you a better idea about –preserve-triggers. Upto MySQL 5.6, Only way to alter the tables using pt-osc is to drop the existing triggers and create after the alter done. From MySQL 5.7, We can use –preserve-triggers option of pt-osc for seamless schema changes though we have triggers present on our table. It gives us one more reason to recommend MySQL 5.7 upgrade. I also feel pt-osc can be provided with support for the tables with before triggers at least for MySQL versions until 5.6.